We were in Northern California recently and visited a very techie friend whose Bluetooth headset was always near his ear. It looked odd, but it’s a good idea really. You’re not fumbling for your phone when it rings, or risking the radiation that comes from holding it next to your ear for long periods. If we were heavy users (we only make three or four calls a month), we’d take a look at three new hands-free devices from Motorola: Finiti, CommandOne and Roadster. All three headsets are getting good reviews for their call quality. Finiti is the fanciest of the three. In extreme conditions– where you otherwise couldn’t be heard at all– it converts vibrations from your throat into speech. Using “rapid charge,” you get 2.5 hours of talk time for 15 minutes of charging. You can choose to say “answer” or “ignore” when a call comes in. 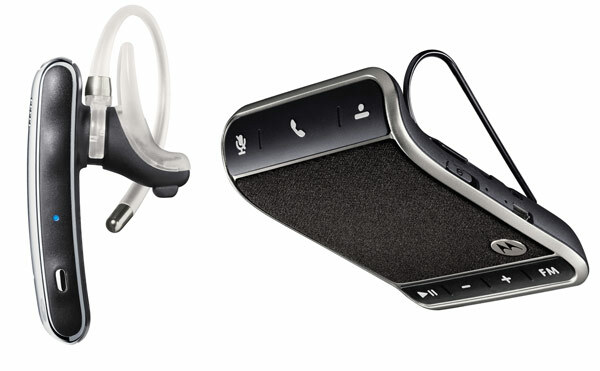 All three headsets have the new “Motospeak” app, which lets you know who’s calling by announcing the callers’ names. However, this only works with Android phones. If you don’t like wearing a gizmo over your ear and are always driving, consider the Roadster. It fits over your car’s visor. Headsets start at $99.